Expero Blog | Toward a Screenless World? Several years ago, I attended a neat speech by a young but awesome UX Designer named Golden Krishna, with credentials ranging from product innovating at Samsung, to designing at Zappos, to writing for major publications. The speech was titled “The Best Interface Is No Interface,” and the room was packed—presumably full of user interface designers. It was a great hook. I loved this speech. It was dynamic, engaging, and completely different from the thinly veiled advertisements for products and processes that seemed to define most of the presentations at South by Southwest that year (every year?). (Exception: the one about the cat video phenomenon. That one was awesome, too, and as timeless as Shakespeare.) This speech was a cut above the rest by no small margin, and I will freely admit that Golden’s delivery was as captivating and refreshing as his topic. His Colbert-esque sarcasm and wit mixed with his earnest, sharp intelligence won me over immediately, even if I was, at the outset, skeptical of his thesis statement. So, when I got my hands on an advance copy of Golden’s new book by the same name, I was superexcited. I thought, This is going to be great. All those great ideas compressed into a bunch of pages (which, in fact, I used a screen to read; sorry, Golden) that I’ll be able to read and re-read and disseminate and even quote to unassuming non-tech-industry bystanders! ‍Our love for digital interfaces is out of control, writes Krishna in The Best Interface Is No Interface. I was not disappointed. I know, as a savvy reader, you expected me to build you up dramatically and expectantly in the last paragraph only to bring you down comedically in this one. I’m not going to play games with you. This was an excellent read, riddled with that Colbert-esque sarcasm and wit and earnest, sharp intelligence that was so engaging at South by Southwest 2013. Golden’s book thesis, similar to that of his speech but perhaps with time a little more honed and a little more frustrated, is simply this: that “our love for the digital interface is out of control…and our obsession with it is ruining the future of innovation” (p. 4). But he goes beyond the problem of our obsession; he envisions a “screenless world,” in which problems are solved and processes are honed without the digital interface. Reading this book when I did was actually serendipitous to the highest degree (and I apologize for the hyperbolization, but read on); about a week before I started reading it, I was traveling back from New Jersey to Austin after spending the holidays with my family out East. I got to Newark airport a few hours before my flight (anally punctual), found my gate, and then looked for a restaurant where I could imbibe my customary preflight Bloody Mary. The only one I could find that was comfortably close to my gate was in fact uncomfortably futuristic. It had an iPad at every single place setting. Every setting at the bar, and every setting at every table. No more interacting with the server. No more asking your companions “What are you gonna have? I can’t decide.” The dining experience would now be a set of isolated eating pods. 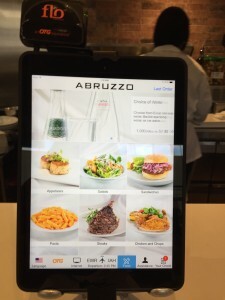 So, as I was uncomfortable with this impersonal, screen-based restaurant (I love traveling alone and meeting neat people wherever I end up), I passed by in search of a lower-key, less tech-y bar (maybe a Chili’s?). Now, make no mistake, I am what many might consider a tech nerd. I am not a digital native but I do embrace the technologies that I think make our lives easier, more connected, and more accessible. I work in the tech industry. I know way too much about user behaviors and user patterns and user goals. But I was not impressed at all by this uncomfortably futuristic restaurant. 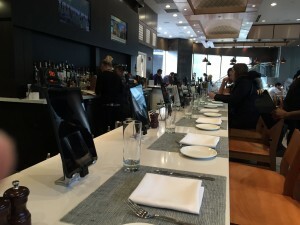 Unfortunately for me and my sensibilities, I couldn’t find a bar comfortably close enough to my gate, and ended up circling back to the Restaurant of the Future. I sat at the bar, iPad in front of me, and fired it up. It was pretty user-friendly, I’ll admit—I found my Bloody Mary easily enough and even got to choose my garnishes!—but when it came time to swipe my credit card…it didn’t work. So I flagged a bartender down (would he talk to me, or just point at the iPad mutely and wait for the ticket to print out on his end?) and he said, “Oh yeah. That one’s broken,” and took the iPad from the place next to mine, asked me my order, and tapped it in for me. Then I swiped my credit card. Ummmm. How is that experience easier/more fluid/more intuitive than the tried-and-true ordering from a human being? And when did ordering from a human being become a problem that needed to be solved in the first place? So, as I was reading, a week later, Golden’s treatise on the wide world of screen-based “thinking,” I not only appreciated the narrative as an avid reader; I also had an actual real-life example under my belt of why this interface obsession has driven us completely off the rails! We’re not thinking of actual solutions to problems; we’re making apps and screens that look neat and maybe have an “innovative” scrolling mechanism or a “new and improved” interaction. We’re getting “more UI, not better UX.” And, as Golden points out, those are not the same. If you hire a UI designer, you’re going to get more (maybe better) screens. If you hire a UX designer, you’re going to get real solutions. 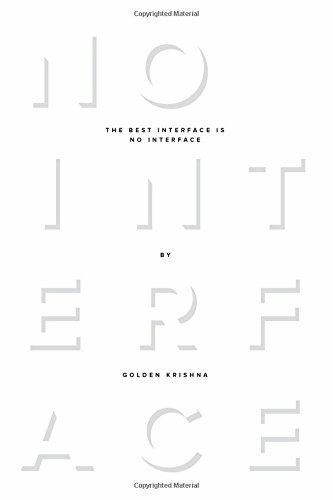 Here’s the thing about this book (which, if you haven’t already gathered, I love): Golden goes further than just saying, “We need to be more mindful of what solutions need a screen and what solutions need something more.” He takes a stand—a bold, maybe heroic stand—that I, as a recreational user of interfaces and also a paid employee in interfaces, am naturally resistant to. Yes, his ideas are new and innovative and neat. Yes, he’s funny and sharp. Yes, he provides countless examples—relatable, commonsense examples—that back up his points. Yes, his book makes me think, ponder, imagine. ‍“Innovation” centers around the world. But are they really just screen-making centers? But I’m still not convinced that NoUI is the future. I’m still hesitant to walk away from the digital interface in the same way I’ve almost completely eschewed paper. There are things I need it for, after all! Things I can’t imagine a different or better solution to, other than a screen! Things like Candy Crush! Things like InDesign! Things like writing this post! Things like what I do for a living—Enterprise UX! Sure, Golden’s ideas make sense for everyday things like key fobs and air-conditioning units and refrigerators; these things do not need an app, and in fact shouldn’t have an app. The key fobs and air-conditioning units and refrigerators should be the solution in and of themselves—without a screen. But what about those of us working in (or for) large enterprises, where the majority of the work is screen-based, and in fact the typical processes are to use screens, and in fact the screens actually solved long-ago problems of loss and accountability and workflow gaps? Is there a screenless future for enterprise? What does that look like? How do we solve those problems? The answer is: I don’t know, and I don’t know if Golden knows, either. He doesn’t write about Enterprise UX specifically, but he does imagine a future in which computers are proactive, not reactive. He poses the question: “What if instead of trying to build reactive conversations with the computer, we instead aimed for proactive help with our unique, individual needs?” (p. 176)—which is to say: “Let’s empower computers to observe the world beyond form fields. Let’s give them the ability to sense our needs with sensors and other signals. Let’s replace tedious user input with instantaneous and painless machine input—where the computer system finds the information it needs on its own—whenever and wherever possible” (p. 140). Does that mean that NoUI only works when the system knows the right behavior without user input? Is that, possibly, the answer to a screenless Enterprise UX? A system devoid of user input that works in the background, quietly and unobtrusively? And, if so, what does that mean for the future of enterprise itself where traditionally human-driven tasks would theoretically be automated? Is this a real possibility? What are the problems associated with screens in Enterprise UX? Is it a simple case of tedious user input? Golden admits that there are exceptions to the screenless world. He admits the screenless world isn’t the only solution. He admits screens are probably—if nothing else—a good backup. He admits, too, that he might be wrong. What he wants is to start a conversation—and what better way to do so than to make a seemingly outrageous claim and watch the world come out of the woodwork? Whether you’re in The Industry or not, reading this book will, if nothing else, give you a new perspective and a few laughs. Have at it!